Betty Oderwald, president of the Connecticut State Society of the U.S. Daughters of 1812, speaks Wednesday, July 4, 2012 during the 119th annual Independence Day Celebration at Town Hall in Fairfield, Conn. Photo: Autumn Driscoll / Connecticut Post. 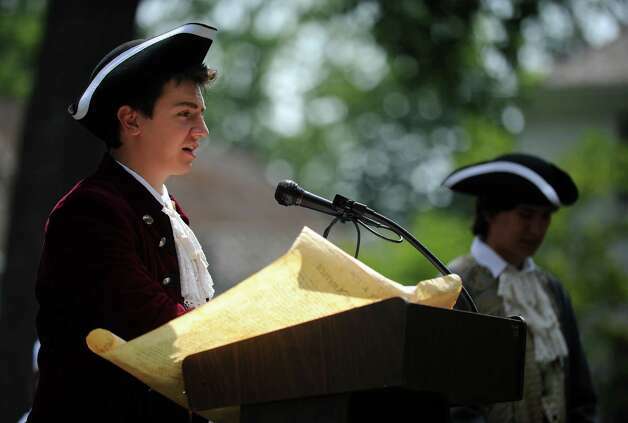 We hold these truths to be self-evident ..."
The words reverberated across historic Town Hall Green on Wednesday morning -- and across the centuries -- as the town celebrated Independence Day in keeping with local tradition. The 119th annual Independence Day salute featured patriotic songs sung by Sophia Filan, fife-and-drum music from the Spirit of 1776, speeches about Fairfield's role in the history of the United States, and three young men dressed in Colonial-era garb who took turns reading from the Declaration of Independence. Max Rein represented Thomas Jefferson, Dylan Levinson embodied John Adams and Sam Jones portrayed Benjamin Franklin. After reading the document, which declared America's independence from Great Britain, Rein, Levinson and Jones read the names of each of the document's signers. "When you visit other towns around this great country of ours you realize they all weren't here in 1776 ... They all weren't around in 1812 when we fought for independence the second time. Our town has been an integral part of our (nation's) history since the very beginning," said First Selectman Michael Tetreau. He asked the crowd of about 100 people to respect and honor the military veterans who kept their freedoms intact and those who continue to fight for those freedoms today. "Don't miss an opportunity to tell them, `Thank you.' We are here today and we can be here today because of their sacrifices, their efforts, their fighting on our behalf," the first selectman said. Tetreau thanked members of local chapters of the American Legion, Veterans of Foreign Wars and Daughters of the American Revolution for hosting the annual celebration "and making the Fourth of July live for us to be more than just fireworks, hotdogs and hamburgers, but to be a real part of who we are and help us remember how we got here." 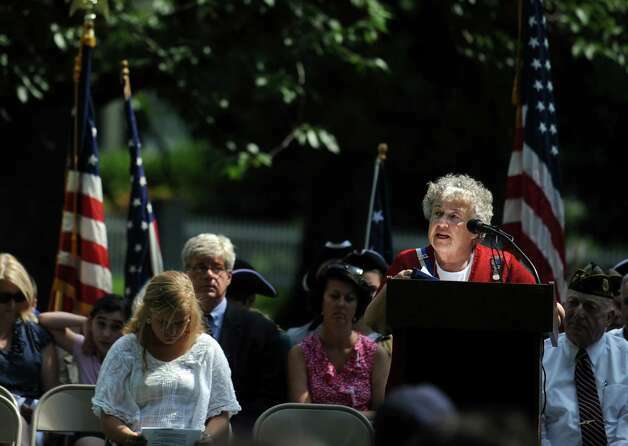 Betty Oderwald, a Fairfielders who is president of the Connecticut State Society U.S. Daughters of 1812, reminded the crowd that Benjamin Franklin said after the Revolutionary War that the war of independence was yet to be fought. "The War of 1812 was that war of independence," she said of the military action that celebrates its bicentennial this year. "It was the war that established the United States as a nation able to negotiate the quagmire of European politics and bring England to a peace that sacrificed no American territory ... It was the foundation to create a nation from sea to shining sea," she said. Oderwald highlighted the roles of some local residents who contributed to the fight and helped the nation achieve its freedom, among them Caleb Brewster, Commodore Isaac Chauncy, Captain Peter Burr, Levi Jennings and Roger Minot Sherman, nephew to Roger Sherman, the only man to sign all four documents of the Revolution, including the Declaration of Independence. She referred to the War of 1812 and the men who fought as "the forgotten war, the forgotten veterans." Oderwald also talked about the historic Powder House off Unquowa Road, a "Fairfield treasure," which is the only remaining powder house in the state of Connecticut built for the War of 1812 and still standing. Many in the crowd wore red, white and blue, including Len Paoletta of Easton and a former Bridgeport mayor, whose shirt depicted an American flag and the Statue of Liberty. "I wear this shirt three times a year. It's very patriotic," said Paoletta, who took several of his grandchildren with him to the Fairfield celebration. "I was looking for something appropriate to the day, something that represents the meaning of the day, and we thought this was it," he told the Fairfield Citizen, bemoaning the fact that too many people use the holiday for shopping, picnics and fireworks. "Freedom is not free," he said. Paoletta said he hopes future generations hold on to the true meaning of July 4th. The sentiment was not lost on some of the young people who participated or attended. Jasmine White, 8, of Roswell, Ga., visiting her grandmother Sue Noyes of Fairfield, said she thought the program was instructive. "I got to learn more about history," Jasmine said. Lily Phillips, 9, of Fairfield, carried the American flag in the Procession of the Colors. "I really enjoyed when they read the Declaration of Independence. It felt so real with them being in costume. 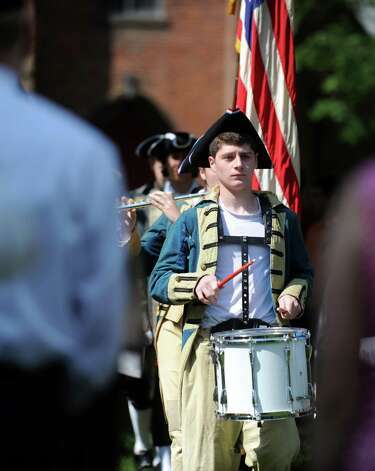 It kind of felt like I was in town for the actual reading of the Declaration of Independence with the bells ringing," said Lily, a member of the Children of the American Revolution. 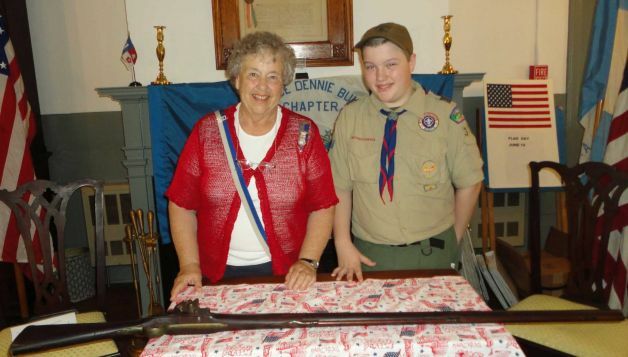 Her mother, Robin Phillips, assistant vice regent of the local DAR chapter, said she was pleased young people were able to get a sense of why the Revolutionary War and War of 1812 were fought and why people continue to celebrate the Fourth of July each year. "It's more about the birth of American freedom than fireworks and hotdogs," she said.